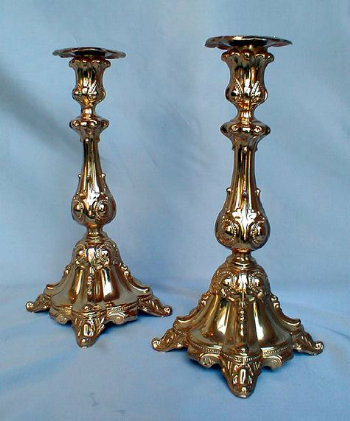 A Pair of 24 karat gilt Polish Sabbath Candlesticks. Marked by retailer "Jurst & Company, Berlin." ht: Approx. 10". Baluster stem rises from fluted and squared footed base detailed with delicate acanthus leaf motif and beaded bosses. Complete with removable beaded and leaf detailed bobeches.